Absolutely yum, Has a great strong flavour and is perfect for pizza or risotto. Love it fried in some spicy pasta too it has a taste that can be found unlike other things that can disappear in the sauce. We love this especially for risottos or pastas. We have tried most brands out there however this is our go to. I highly recommend trying this! I tend to buy these chorizo in winter. They are delicious sliced and cooked in a soup with tomatoes, risoni and white beans. They’re also a great starter if you slice them and lightly fry, and serve with lightly fried haloumi. Not the healthiest, but tasty! These ones have just the right amount of saltiness and spice. 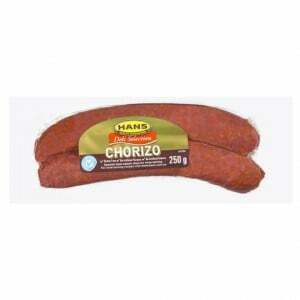 How would you rate Hans Chorizo?